Welcome back to my site! Today I have another fun freebie for you. Since everyone liked my First Grade Sight Word Search worksheets, I made some more! so today I have a fun new freebie for you! It’s the Second Grade Sight Word Search worksheets. These activities are just another fun way to help your student identify and read each sight word. 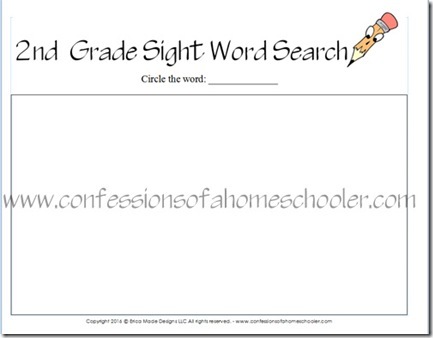 Keep reading to download this freebie, and see how we use these worksheets in our homeschool! What’s Included in the Second Grade Sight Word List? always, around, because, been, before, best, both, buy, call, cold, does, don’t, fast, first, five, found, gave, goes, green, its, made, many, off, or, pull, read, right, sing, sit, sleep, tell, their, these, those, upon, us, use, very, wash, which, why, wish, work, would, write, your. I have also included a blank sight word search sheet at the end so you can create your own word search as well! 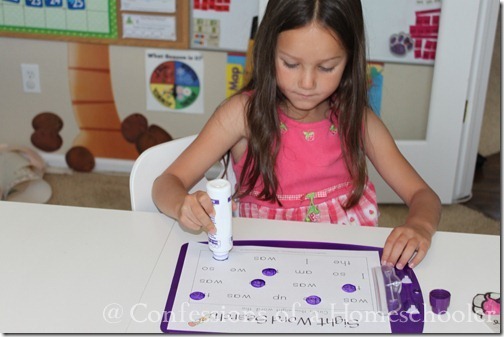 How do you use the Sight Word Search worksheets? Photo from a few years ago when my sweet baby Tinker Bell was in first grade! Isn’t she cute! Mark words using cheerios, gold fish, M&Ms, raisins, or any other edible manipulative, then eat your completed sheet! 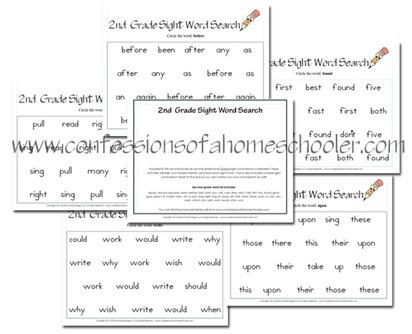 I hope you enjoy the Second Grade Sight Word Search worksheets! Want to see more of these? Let me know what grades you would like to see in the comments below. CLASSROOM USE: You are welcome to print and use my free downloads in your classroom as needed! However if you chose to use a paid curriculum, please make sure to download the classroom version for proper use in your school. Is my Letter of the Week Preschool Curriculum a little too easy for your student? Are you ready for something a little more challenging? Then the K4/5 Curriculum is for you! The K4/5 Curriculum is geared towards kids ages 4-5 who are kindergarten ready and want a fun hands-on kindergarten curriculum. The K4 curriculum covers beginning reading and phonics skills as well as basic math addition, subtraction, and skip counting skills and more! I tried to click on “Kindergarten Sight Words” but it came up BLANK. But I was able to download 1st and 2nd grade sight words. Any suggestion? I have a kindergarten kid and I would love to use your method for him.